2 Perkins Diesel engine, M275TI 220 Hp each and a total of 278 hours only. engine spares: Quelques pièces de rechange notamment un kit d'embrayage et des pièces d'inverseur. Ex Italian custom boat, built in 1978 by the Spezia Del Viragnano yard. Ex Italian custom cruiser transformed as a live aboard. Access from both sides through a door to the weelhouse. A confortable and bright saloon with a convertible sofa for occasional guests. In the aft a galley and a corridor leading to the aft owner's cabin (double bed 140x190) with ensuite shower room and heads. In the forward, two cabins, one double (110 x 180 cm) with a single bed ( 80 x 180 cm).Shower and basin in star board side and an independant heads on port side plus an utility room. In the forepeak, another double cabin (140 x 190 cm). Headroom in the boat is 2 m everywhere. insulated boat, with central heating by a reversible air con plus oil drip stove. Grey tank (350L) and Black tank (400L). A large convivial aft deck to entertain. 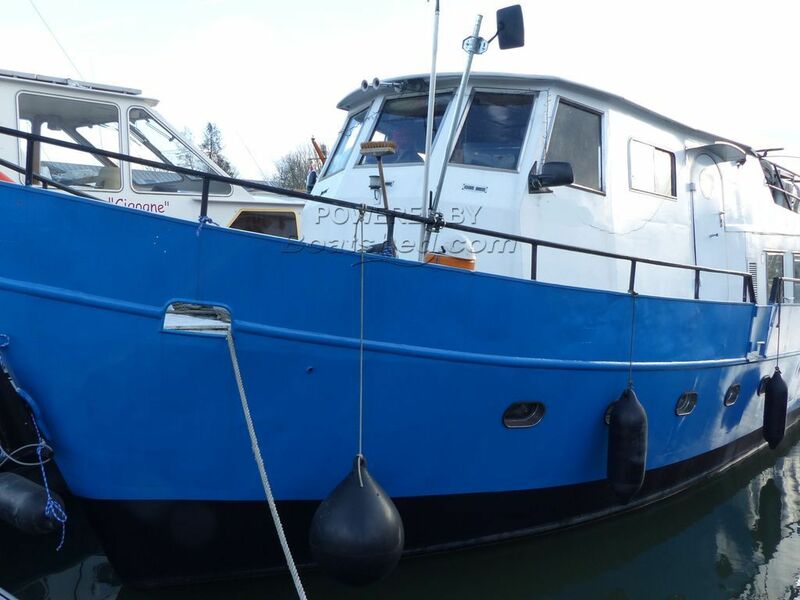 Motor cruiser, ex Italian Customs vessel for sale in France. Boatshed Paris is happy to offer this 14.50m in South of Paris Region. Hull surveyed in September 2016. Antifouled in 2016. The comfortable interior might need some cosmetic works or let as it is, currently used as a live aboard. Moored in a secure with free parking marina, south of Paris, 5 min away from the main train (RER) station 20 Min away form Centrale Paris. Mooring could be transferrable under request. For more information or organise a visit, please contact your local broker, Pascal GAETAN, at Boatshed Paris. This Classic Motor Cruiser has been personally photographed and viewed by Pascal GAETAN of Boatshed Paris. Click here for contact details.